Fits: Kingsman - Z33FK, ZDV3320, ZDV6000. Blower Size - 10.5" Length x 4.3" Height x 3.6 Width. Blower Wheel: 2.6" x 7.1". These are designed to be replacements for the listed blower model number. The blowers are aftermarket models-not original equipment. Be sure to compare the dimensions listed to your unit to be sure it will fit. The blowers are "contractor kits". Intended to be installed by a qualified technician. Units do not come with installation instructions. 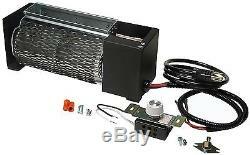 The item "Kingsman Fireplace Blower 115V (Z33FK, ZDV3320, ZDV6000) # HB-RB37" is in sale since Friday, August 24, 2012. This item is in the category "Home & Garden\Home Improvement\Heating, Cooling & Air\Fireplaces & Stoves\Replacement Parts". The seller is "electric-motor-warehouse1" and is located in Burton, Michigan. This item can be shipped to United States, Canada.